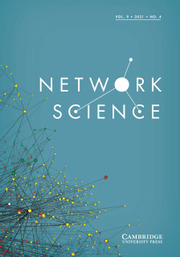 Network Science is an important journal for an important discipline - one using the network paradigm, focusing on actors and relational linkages, to inform research, methodology, and applications from many fields across the natural, social, engineering and informational sciences. Given growing understanding of the interconnectedness and globalization of the world, network methods are an increasingly recognized way to research aspects of modern society along with the individuals, organizations, and other actors within it. The discipline is ready for a comprehensive journal, open to papers from all relevant areas. Network Science is a defining work, shaping this discipline. The journal welcomes contributions from researchers in all areas working on network theory, methods, and data.